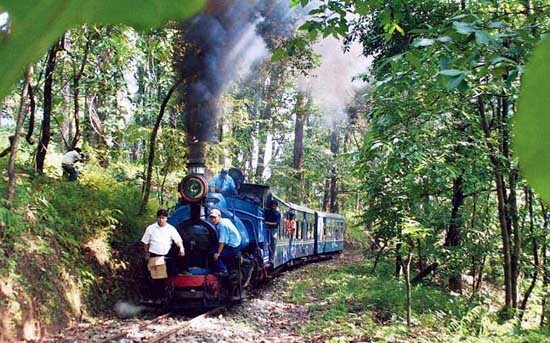 The iconic Darjeeling Himalayan Railway, also known as 'Toy Train,' is set to be preserved for posterity. UNESCO and the Indian Railways have embarked on developing a 'Comprehensive Conservation Management Plan' (CCMP) for the vintage British-era rail heritage. A core and buffer zone will be fixed for the 78 km-long narrow gauge rail which runs between New Jalpaiguri and Darjeeling. Guidelines will be prepared for maintenance of its beautiful steam locomotives, machinery and historic stations like Kurseong. Even its intangible heritage like craftsmanship will be documented. An expert team has already visited the site twice. It's a two-year-long project and a fund of over 5.33 lakh US dollars is involved. Darjeeling Himalayan Railway (DHR) was declared a World Heritage site by UNESCO in 1999, only the second railway after Austria's Semmering (1998) to have this honour bestowed upon it. It was also Asia's first 'industrial heritage' site to be inscribed on UNESCO's World Heritage List. Universally, the first was Poland's Weiliczka salt mine (1978). Designed and built by the British in 1880, Darjeeling Himalayan Railway quickly opened up north Bengal's sleepy hill economy. Villages, tea estates and residential schools grew up around it. Subrato Nath, Executive Director (Heritage), Railway Board, told Mail Today, "It was the original UNESCO 'Decision Document' (1999) to select it as a World Heritage Site, which included the clause for an 'adapted management plan.' It also mandated the creation of a buffer zone along the length of the railway and a local conservation unit." "However," he continued, "Unlike the Red Fort or Taj Mahal, the Darjeeling Railway is unique for being a 'living heritage.' It has been constantly evolving with modernisation and introduction of new passenger amenities, and thereby, facing many pressures. So after many discussions, we decided to let UNESCO itself prepare the tough conservation plan." Two global NGOs--International Council on Monuments and Sites (ICOMOS) and The Industrial Committee for Conservation of Industrial Heritage (TICCIH)--are assisting UNESCO experts on the project. Rohit Jigyasu, President of ICOMOS (India), said, "Despite of having such a rich railway heritage--India's Mountain Railways network, the Nilgiri, Kalka-Shimla and Darjeeling rail combined are inscribed as UNESCO World Heritage--we do not have any conservation guidelines for it. Therefore, this initiative is very important." He added, "The plan will look into every detail such as the wall colour of the stations, benches and even the old lamp posts. We will ensure that the colonial-style special architecture of DHR's 11 stations are not disturbed. A repair and maintenance manual for them will be prepared. Same will be done the steam locomotives, their wagons and machinery. The craftsmanship of these will also be documented." "In view of this, a complete disaster risk management plan will be prepared," said Rohit. "Other than that, the picturesque views that the Darjeeling Himalayan Railway offers has to be protected, hence the conservation plan will also have tight strictures on unauthorised slums and encroachments," he added. The Indian Railways is also planning the digitisation of its heritage inventory. All details regarding its 14 museums and 11 galleries, spread across the country, will be uploaded on a specially-designed website. This includes Delhi's National Rail museum. Subrato Nath, Executive Director (Heritage), said, "This would be a first-of-its-kind virtual museum. We have 323 adorable steam locomotives, including some in private collections.